Born: 9 December 1845, Walsoken, Norfolk, United Kingdom. Died: 13 March 1906, Pietermaritzburg, South Africa . John Goodman ("Jack") Household (or Houshold), aviation pioneer, came to South Africa with his parents, William John Household and Elizabeth Frusher. The family settled at Karkloof, near Howick, KwaZulu-Natal. From 1864 John Goodman stayed with his father on the farm Der Magtenburg in the area. In 1871 he prospected for gold along the Tugela River and a few years later owned a stone house at Tugela Ferry. 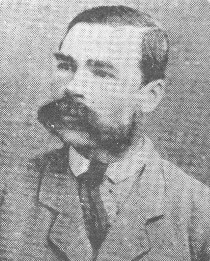 A photograph of him taken in 1871 shows him to be a dark haired young man with dark eyes and a thick black moustache growing round to the base of his jaw line, wearing a tweed suit and dark tie. Household's interest in the flight of birds led him to consider the possibility of human flight and it appears that, in about 1875, he built a glider and conducted at least one partially successful flight. This took place on the farm where he lived, with the help of his brother Archer. His machine, which consisted mainly of a wing, appears to have been constructed of bamboo covered by some light material. Take off was achieved by holding the wing aloft and running downhill, resulting in flight over a distance estimated as about 230 m. The flight was partially controlled, but seems to have ended accidentally in a tree. Though he escaped injury he did not conduct further experiments. His flight was the first known to have been undertaken in South Africa. However, it created no public interest at the time and no contemporary descriptions of the experiment exist. Discrepant accounts of the event were written up only decades later. In 1995 the Lions River Heritage Society and other donors recognised his flight by erecting a commemorative monument on the district road between Karkloof and Curry's Post. Household was not married. He later lived at Umkomaas, KwaZulu-Natal. Dictionary of South African biography, Vol. 3,1977. National Automated Archival Information Retrieval System (NAAIRS). http://www.national.archives.gov.za/naairs.htm Documents relating to John Goodman Household / J.G. Household. Oberholzer, H. Pioneers of early aviation in South Africa. Bloemfontein: Memoirs van die Nasionale Museum, Vol. 7, 1974. Tribute to SA’s father of aviation. Sunday Tribune, 2017-6-4. Retrieved from https://www.pressreader.com/south-africa/sunday-tribune/20170604/28194313284777 on 2017-12-5.